This post is part 2 of my Creating a Pattern Collection blog series. If you have not read part 1 of this series, Creating a Pattern Collection: From Concept to Sketch, you should read it first before reading this post. In this post, I will continue showing you how I am creating my newest pattern collection, designing patterns in Illustrator, and the resources I learned from to make a seamless repeating pattern design. There are two ways you can color your artwork and there are big distinctions between both methods. One method is coloring your sketches prior to digitizing them with traditional mediums, like watercolor, fine markers, and the like. Another method is to color your artwork in Illustrator after digitizing your sketches. If you are a watercolor, marker, or paint artist, and want to keep the texture and variation in coloring your sketches prior to bringing them into the computer, that is a natural way to go. It is also how I am colorizing my newest pattern collection and using as an example in this series. I have done several pattern collections, and wanted use the watercolor painting skills I have developed over the last year for my new collection. I have never done a watercolor pattern and really wanted to challenge myself as a designer. The look of watercolor fits the style I am envisioning for this new collection, and I like the softness and subtle variations in color the watercolor artwork will bring to the finished pieces. Jenn Coyle, from HelloBrio, posted her new Skillshare class, Watercolor Meets Surface Pattern Design. Update: Bonnie Christine also has a new skillshare class called Watercolor for Surface Pattern Design, and you can check out that course too. Coloring with vector using Adobe Illustrator is another way to colorize your sketches to create your pattern repeats. My other pattern collections are done this way, and this method produces beautiful illustrations. You should start with an outlined sketch and scan in the motifs using Adobe Photoshop to brighten your sketches and give more contrast to the scanned artwork. Then, bring your sketches into Illustrator to vectorize by using different tools in Illustrator. I learned to create vector pattern repeats from Bonnie Christine’s and Elizabeth Olwen’s classes on Skillshare. Their classes are very detailed; are the reason I fell in love with surface pattern design; and ultimately decided to pursue becoming a surface pattern designer. If you want to learn the ins and outs of creating vector patterns, I highly recommend their classes. Bonnie Christine has several Skillshare classes covering surface pattern design, but if you are just getting started, I recommend starting with her intro class. 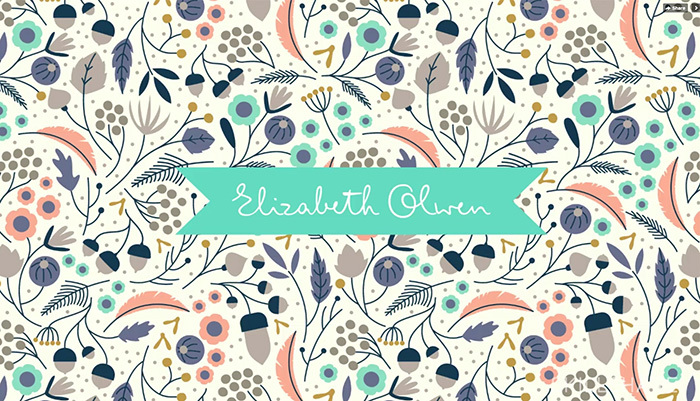 Elizabeth Olwen has multiple Skillshare classes teaching surface pattern design techniques. I have learned patterning from these courses, and use a combination of their teachings in my design process. My new collection is going to be colorized with watercolor, so this method will be mainly what I show examples of throughout this post. But, I just wanted to let you know in advance why this post will focus on coloring with watercolor prior to making my repeats. In this picture, I have transferred my sketches onto watercolor paper and painted them. I transfer the sketches by using a lightbox and tracing with light pencil lines or graphite transfer paper. You could also sketch on your watercolor paper and then outline first with waterproof pens and erase the pencil marks prior to painting. But, I like to outline last just in case I decide to not do an outline. Once a few of the pieces are done, I cut them out of the paper and scan each one into the computer individually using my scanner. This gives me a separate image of each piece to edit later, and I won’t have to cut out each piece from the scan to make adjustments. You could scan them all in at the same time if you prefer, but this is just how I do it. Everyone has their own preferred process and should do it the way they find easiest. When I do vector designs, I do scan in all my motifs at once. 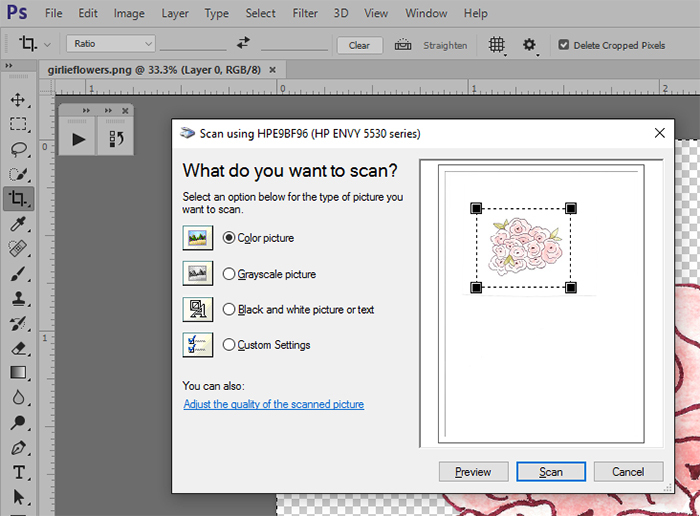 When you are scanning in artwork be sure your scanner is clean. Each scanner is different, but for mine I use the color picture setting and scan my artwork at 300 dpi. This will give me a nice high resolution image to work with for my pattern, and capture all the shading details of the watercolor work. Once you have scanned in your work, save your original scan. Next, we will edit our scanned in artwork and prepare it for creating a repeat pattern. With using scanned images, you will need to remove the white background from your artwork so you are left with only the artwork itself and not the white background of your watercolor paper. This step is important when creating your repeat so you only have the artwork, and not a white background. In order to create a scalable repeat, you will need to vectorize each of your watercolor motifs. These are a few of the watercolor motifs from my new collection after being scanned in and vectorized. Once you have all your watercolor elements scanned in and vectorized, you can begin to put together your repeating patterns for your new collection. If you completed the Pattern Concept Workbook provided in Part 1, refer to your outline for each pattern theme for your collection to create the number of patterns you need. It will help guide you in planning out each matching pattern repeat for your collection. This is one of the finished watercolor patterns from my new collection. Read the next post in this series, Creating a Pattern Collection: Pattern Repeat Types. Which method have you used? Have you made a watercolor repeating pattern? What theme is your collection going to be?